The family hotel entertainment options at Hotels Viva make for an unforgettable stay in Majorca and Kids who stay at Viva Sunrise know this all too well. 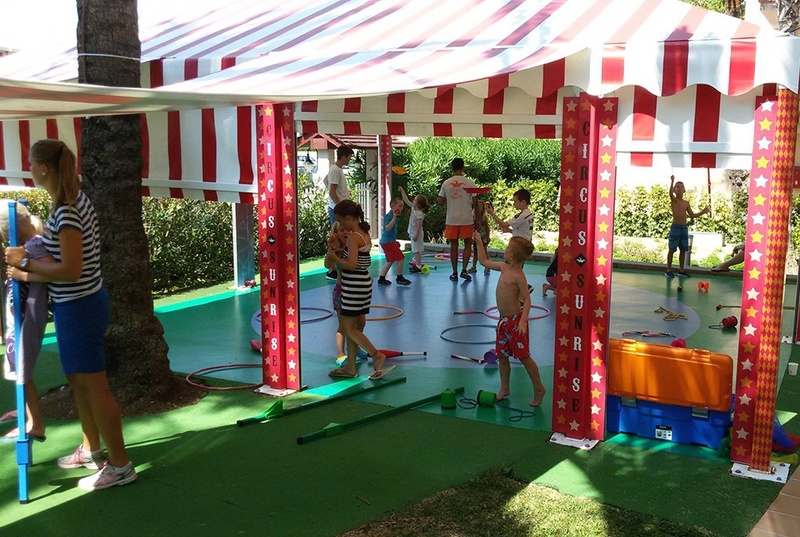 This holiday aparthotel in the Alcudia Port offers a fun and exciting programme called Viva Circus with circus-themed activities for kids. The Pirate-Ship swimming pool and Bufo’s Mini Club combined with this unique entertainment option are the perfect mix for an enjoyable stay for kids and adults at VIVA Sunrise. Viva Circus allows kids to develop circus related skills and abilities which they can later demonstrate in an entertaining show. Viva Circus has become the favourite activity for kids who spend their family holidays at VIVA Sunrise. Two days a week on Tuesdays and Thursdays, kids rehearse different types of games and tricks related to the wonderful world of circus. Rehearsals last approximately 45 minutes (from 11:00 to 11:45am) allowing kids to try a variety of exercises with the objective of choosing the one they most like. Although VIVA Circus is for Kids age 4 and, younger kids can also participate if accompanied by a parent. During rehearsals, kids learn a variety of games which they later demonstrate in the shows scheduled for Thursdays. 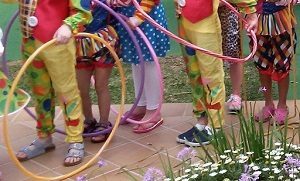 They can choose from a range of circus activities including hula hoops, skipping rope, stilt walking, diabolo, small rings, ball juggling, plate spinning. “The idea is to allow kids to practise until they get it right. Most kids try almost everything and then decide which activity they want to perform on stage,” explains Marta Polti, Director of VIVA Sunrise. After the rehearsals it’s time for the stage where all participants have the opportunity to showcase their new talents in a 20-minute show that takes place every Thursday at 8:00pm. Prior to the show, all the kids who participate in VIVA Circus go to the dressing room to choose a circus costume or have their faces painted as clowns. The number of artists that participate in the show can vary. At times we have had 4 or 5 kids participating in a show and other times we have had as many 25 kids on stage. “Any kids who want to participate are welcome,” says the director of the hotel. Many of those who take part in VIVA Circus repeat the activity and if they are enjoying a two-week stay at the hotel, they‘ll have the opportunity to participate in two shows. VIVA Circus rehearsals and shows provide a fun and positive atmosphere, making your family holidays at VIVA Sunrise truly unforgettable.